53 year old female (5’8″, 206lbs) underwent a silicone breast augmentation in 1993 in Utah. She presented with breast pain and swollen lymph nodes, desiring implant removal. 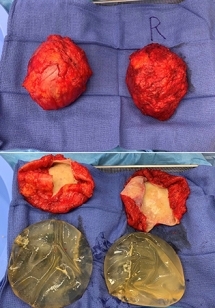 The procedure performed was an En Bloc Capsulectomy, which involves the complete removal of the implant with the capsule of scar tissue surrounding the implant, so as to remove all of the ruptured silicone from her body.